Parrot is a division of a French manufacturing company Parrot SA. Parrot makes FPV drones and mini drones. The current Parrot popular line-up includes the powerful and robust Parrot Bebop 2 power series, Parrot Disco (fixed wing) model, and the exciting Parrot mini drone Mambo series. We have been fans of Parrot drones since Parrot AR drone was introduced in CES Las Vegas in 2012. 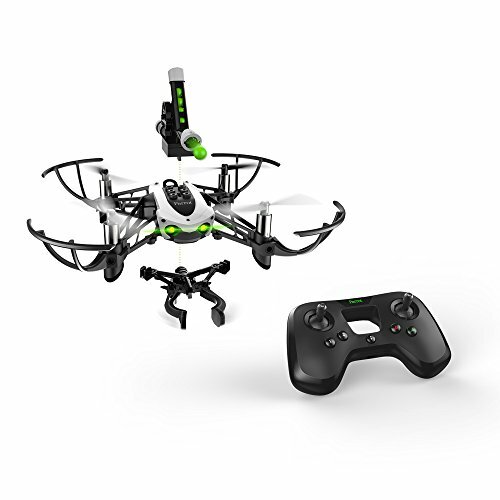 The Parrot AR drone is widely used in research and education due to its open source framework for app developers. Summary: The Parrot Bebop 2 power FPV pack (View on Amazon) is an advanced outdoor drone for an experience drone pilot. 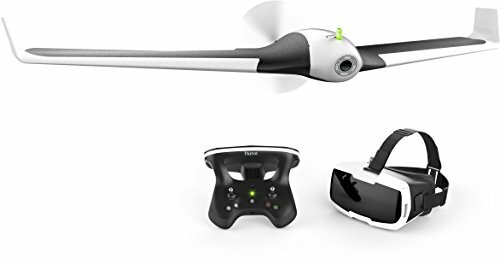 This FPV pack includes two batteries to provide a total of 60 minutes of battery life (30 minutes each), FPV goggles Parrot Cockpit glasses, Parrot Skycontroller and a new flight assistant system. Read our review of Parrot Bebop 2 Power FPV quadcopter. Speed: impressive 65km/hr. in sport mode. Wind resistance: up to 60 km/hr. Camera: 14MP CMOS 1/2.3″ camera lets you shoot in Full HD 30fps and take JPEG and Adobe DNG RAW photos for post-production image editing. 3-axis digital stabilization: provides stable platform for digital imagery. Intelligent flight mode: include orbit, tornado, parabola or boomerang movements. 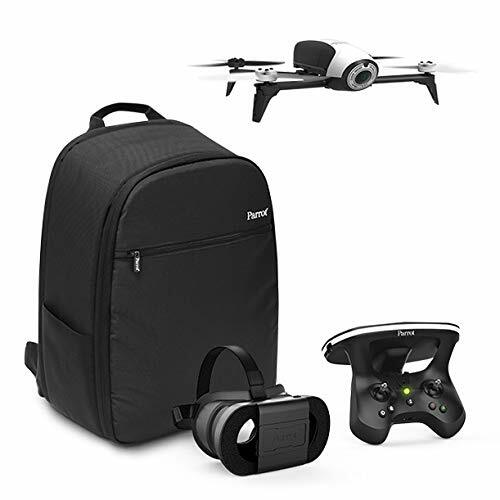 This Parrot Bebop 2 power FPV pack has it all: aerodynamics and propulsion system, power two battery life of 60 minutes, Parrot Cockpit glasses to experience immersive flights, FreeFlight Pro mobile app designed to work with your Skycontroller and the Cockpit glasses, the Follow-Me in-app feature, advanced visual recognition technology and GPS tracking, and much more! If you are going for a smaller budget, consider the older version of Parrot Bebop 2 FPV. Parrot Bebop 2 is the FIRST camera drone in the 500g category with 25 minutes of flight time. You don’t get the new Sky Controller 2. But You still get immersive flight experience with the FPV gogglese. Parrot Bebop 2 FPV has 3-axis digital stabilization system for smooth and stable videos. Summary: The Parrot Disco FPV (View on Amazon) is an aerodynamic-designed, fixed-wing drone. You get the thrilling sense of piloting an airplane using the FPV headset (included), Parrot Cockpitglasses (included), and the new Parrot Skycontroller 2 (included). Parrot Disco top speed: 80 km/hr. (50 mph). Range: 2 km (1.24 miles). Pilot your Disco using the Parrot Skycontroller 2, and use the Parrot FreeFlight Pro to establish connection. You will enjoy Disco’s full 1080p stunning aerial footage while you are piloting this drone. Summary: For those of us who love mini drone formation in the air or/and the thrill of drone racing, the Parrot Mambo FPV (View on Amazon) is the perfect complete starter pack for drone racing. This Mambo FPV comes with the FPV camera and Parrot Cockpitglasses 2 – you have the complete starter gears to plunge into the world of drone racing. You have three flying modes with Mambo FPV: Easy, Drift, Racing. In Easy mode, the Mambo FPV will stay in the air even if you let go of the controls. In Drift mode, the horizontal stabilization is off, this means you can test your piloting skills of making tight turns. In Racing mode, you get total control of the Mambo without any stabilization help. You are ready for drone racing once you master piloting the Mambo in the Racing mode. Summary: Enter the adventurous and FUN world of the Parrot Mambo Mission (View on Amazon) ) – you can go on a mission of speed racing or skill game of cannon or grabber – pick your challenge and let you adventure begins! Parrot Mambo Mission comes with two fun accessories: Cannon and Grabber. Grabber: Attach the Grabber to your Mambo, and you are ready to rescue any object (up to 4 g) and carry them to safety in the air! 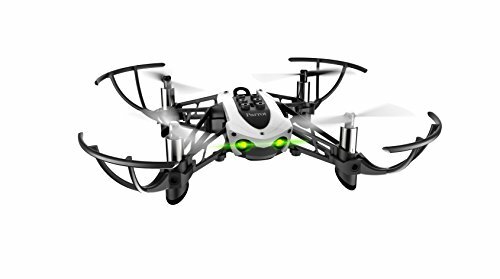 A comparable model is the Parrot Mambo Fly (View on Amazon) – If you want to fly a high-performance drone now, and try out the cannon and grabber accessories later. Parrot Mambo Fly is a scalable drone. 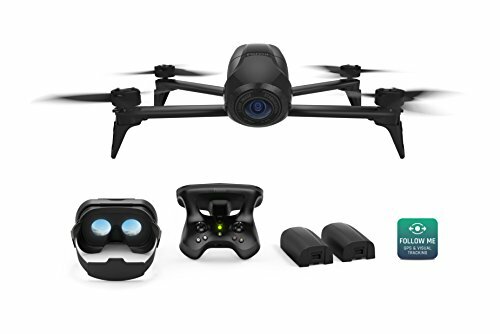 When you are ready to upgrade, you can buy the accessories cannon, grabber or the FPV Camera and connect them to your Parrot Mambo Fly then. The Parrot AR 2.0 Elite Edition (Sand) Quadcopter(View on Amazon) is a FPV drone via your smartphone and it maneuvers easily. Read our review of Parrot AR 2.0 Elite Edition (Sand) Quadcopter. The Parrot AR 2.0 Elite provides a stable platform for smooth videos via its 3-axis gyroscope, 3-axis accelerometer and 3-axis magnetometer. Its downward facing camera and ultrasound sensors are used by the on-board flight controller to maintain altitude stability. The AR FreeFlight app displays functional status such directional control and camera control. It is easy enough to use for a beginner and has enough features for an intermediate pilot. It is well designed for both indoor and outdoor use, including two durable shells, one for indoor use and one for outdoor use. Flight time is 7 to 10 min. If you get the optional GPS Flight recorder, you get flight planning and GPS Return to Home. Summary: The Parrot AR 2.0 Power Edition(View on Amazon) is an indoor and outdoor camera drone – it comes with one indoor hull and one outdoor hull. This is a RTF app-controlled drone, you only need to connect the battery, download AR’s Freeflight 2.0 app and you are ready to fly. It has two 1500mah batteries. Flight time: 15 minutes of flight time from one battery; some people get more than 30 minutes of flight time from these two high-density lithium polymer batteries. Range: 50 m (165 feet).